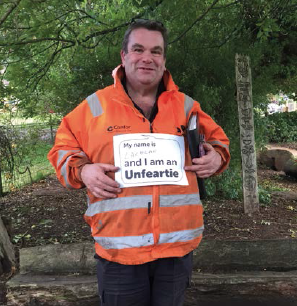 Call 23: Let’s make Scotland a nation of Unfearties! • Listen to children and view them as capable assets to their communities. • Strive to ensure children’s voices are heard and challenge infringements of human dignity. • Help children and adults learn the values of honesty, empathy, respect and social justice. • Promote greater awareness and understanding of children’s rights. • Support children who want to be children’s human rights defenders. • Speak up about the Unfeartie role and spread the message about how to join our movement. The Unfeartie movement started in early 2017 to mark the 21st anniversary of the Children’s Parliament and to provide an opportunity for adults to champion children’s rights. We want to create a world where all children grow up in an environment of love, dignity and respect. To achieve this, we need a culture change in how adults value and listen to children in every walk of life. Much is going on across Scotland to give us hope that this culture change is possible. More children and young people are learning about their rights, and many are keen to become Human Rights Defenders, to stand up for their own rights and the rights of others. Many adults – from community workers and school bus drivers through to police officers and politicians – are Unfearties’ in practice and take every step they can to uphold children’s rights. Whilst the Scottish Government has made a number of welcome commitments to support children’s human rights, Together (Scottish Alliance for Children’s Rights) is clear that further tangible action is needed to make rights a reality for every child. This should start immediately with the full incorporation of the UN Convention on the Rights of the Child (UNCRC) into law - making children’s rights binding, not guiding. For example, Article 31 of the UNCRC enshrines every child’s right to rest, play and recreational activities and to participate freely in cultural life and the arts. This means that children’s rights need to be at the centre of decisions that aren’t always associated with children. For example, decisions made about transport and planning can have a real impact on children’s right to play – affecting the amount of green space around their homes and schools, and their ability to get to places where they can play safely. Children’s Parliament has worked with the A9 Community Group in Dunkeld & Birnam to include children in the planning process for the dualling of the A9. Children from the Royal School of Dunkeld explored their vision for the future of their community, what they valued now and their hopes for the future. This led to the development of five ‘billboards’ that highlighted their key messages which included safety, intergenerational connections, the natural environment, equality and respect, and opportunities to explore interests and talents. The children’s billboards were used as a touchstone with members of the community, Transport Scotland and Jacobs (the contracted engineering consultancy) to develop route options together. This idea was so clever (and cleverly named!) that it made it through to the next stages of the process, and was mentioned by former Cabinet Secretary for Economy, Jobs and Fair Work, Keith Brown in a committee meeting in the Scottish Parliament. Over the summer, Children’s Parliament supported more than 40 children and young people to vote in the Big Decide, an event where the community voted on its preferred route option. When the result was announced, the community chose the same route option that was preferred by children and young people – Route A combined with Junction 1. This option includes the ‘eggabout’, although there’s no news yet on the guinea pig reserve! This work in Dunkeld and Birnam demonstrates the impact of listening to children. They offer a unique insight into the world and their ideas can help shape developments in infrastructure, policy and practice. It also highlights what can be achieved when adults embrace a rights-based approach and value children for what they can offer the world. Children want to be a part of the solution and are keen to share their experiences and views with adults – we just need to listen! So join us, become an Unfeartie today and make Scotland a happy, healthy and safe nation for children. Follow #25Calls to see which organisations have endorsed this call. Article 12: "...the right to be listened to and taken seriously..."